This holiday season spread the compassion you wish to see in the world by sponsoring a rescued turkey at Graze in Peace! You can sponsor and support your turkey from anywhere by donating just $15/month. All proceeds received will go to the food, shelter and healthcare costs of the turkey and it’s surrounding companions. 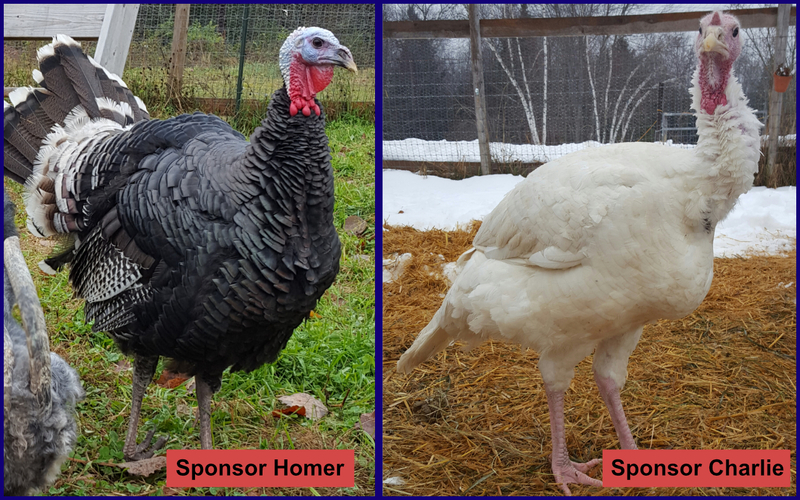 Sponsors will receive a beautiful full-color photograph of your turkey as well as their personal story along with a letter of gratitude from the sanctuary founders. Sponsorships make great gifts for the holidays! To sign-up, simply fill out the form below and choose which turkey you’d like to sponsor. E-mail debjoy@grazeinpeace.com or call (207) 558-2005 with any questions or if you’d prefer to sign-up over the phone.